Piotr Nurzynski took down the biggest European Poker Tour (EPT) Main Event in history, topping a massive 1,931-entry field in Barcelona. Nurzynski took home €1,037,109 following a four-way deal. Nurzynski also claimed a Platinum Pass to the 2019 PokerStars Players No-Limit Hold'em Championship (PSPC), worth $30,000. 28-year-old Nurzynski, who hails from Poland, works as a doctor but he took a two-year break to travel around the world with his fiancé, who supported him in the rail through his journey towards the pinnacle of European live tournament poker. "I can't believe it. It's shocking. I did it!" Nurzynski said in the moments of victory. "It's amazing!" Nurzynski, who qualified to the tournament online at PokerStars, secured himself the Pass prior to lifting the trophy, being the last qualifier in the field after Ognyan Dimov's exit in third place. That allowed the second-place finisher Haoxiang Wang to win a Pass of his own with no player being eligible to collect two Passes. Nurzynski's victory was remarkable in many ways. Not only he outlasted the largest field in the EPT history, he was also able to pull off a fabulous comeback, overcoming a huge chip-deficit in the heads-up match with Wang. Wang started the final duel as a 4-1 favorite but Nurzynski scored a double up, then evened the stacks and worked his way all the way to becoming the fourth EPT Main Event winner from Poland. He is the second Polish player to triumph in Barcelona, following Sebastian Malec's coronation back in 2016. "It's a great feeling. It was one of my craziest dreams to win a tournament like this, one of the most prestigious tournaments, EPT Barcelona," Nurzynski said. Runner-up Wang reached an unprecedented achievement of his own. He was only the second Chinese player to ever appear on the EPT Main Event final table, besting Xixiang Luo's eighth place from EPT 13 Malta. Wang took the biggest chunk in the aforementioned four-way deal, having entered the negotiations as a chip leader. He locked up €1,023,701 for his runner-up finish. 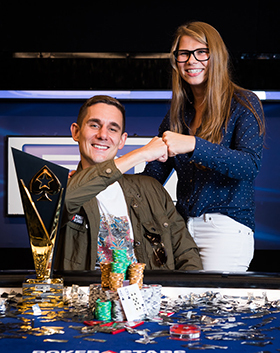 EPT 11 Deauville Main Event champion Ognyan Dimov eyed his second title, having a tremendous opportunity to becoming the first male to pair his title. While Dimov's pursuit was stopped in third place, he was still able to walk away with €725,621, the biggest prize of his stellar poker career. Fourth-place finisher Pedro Marques from Portugal pocketed €698,369 thanks to the deal. Marques' fellow countryman Rodrigo Carmo notched €354,200 for fifth place while Matthias Tikerpe from Estonia received the €287,050 sixth-place prize. The 2018 EPT Barcelona Main Event drew 1,931 entries (including 457 re-entries), making it the biggest EPT Main Event in history. The top 296 finishers shared pieces of the €9,365,350 prize pool. what's his screen name? doctor and z500 reg at the same time sounds difficult.